The Best Day of My Life So Far: Tip #4 Choose happiness. Life is a weaving of good and bad days, small and big moments. I believe that there is always a positive lesson to be found in our past experiences, even if they were devastating and something we have bottled up for decades. I was inspired to start this organization because of a series of phone calls with my grandma. These calls taught me that when an older person speaks from the heart, and a younger person slows down to listen, stories can lead to genuine conversations and a genuine friendship. 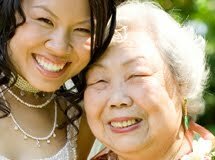 Many of my grandma's stories are about difficult situations or complicated emotions, but after sharing them, she would laugh in the purest, deepest way because she realizes she has just confronted something that has held her back for years. Some of the most devastating stories I have heard over the years led to some of the happiest moments. This set of stories from Millie did exactly that for both her and me. Millie opened up a little more, week by week, story by story, and after every group session she and I stayed after to chat more privately about what she had written. Every week, I could see a greater strength and happiness in her eyes, until one day, she had a total breakthrough. She did the impossible. She broke free from a traumatic childhood experience that had held her back for decades. 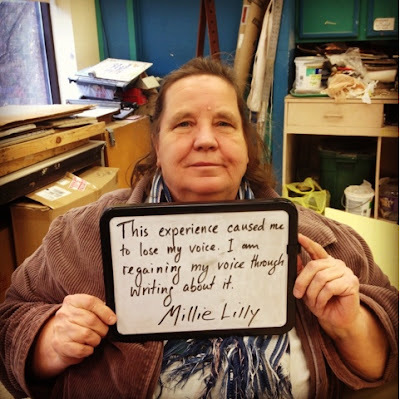 She said this: "This experience caused me to lose my voice. I am regaining my voice through writing about it." She wrote down these feelings for me and let me take a picture, so we can both remember it, word for word, spoken in her voice. After showing Millie the picture on my phone, we looked at each other and we cried tears of joy. The cold and snow have limited my ability to get out as much as usual. I am one of many who really struggle with the conditions. A lot of my time was spent in cold climates. When I was four and a half years old, my Air Force family moved to St. John’s Island, Newfoundland. My older sister, younger brother, father, and pregnant mother lived in a house at the top of a hill. We lived in the basement without a refrigerator. The family who owned the house lived upstairs. They had a son. The wind blew off the frozen water bringing icy cold along with the sounds of the seals being clubbed to death in the early morning. My father tells me the seals sounded just like babies crying. I don’t think there was much thinking about the effects of hearing that crying on the adults or young children. Newfoundland was a harsh place in many ways. Some countries sent people they no longer wanted. Surely some of those people did nothing to deserve it. One of the hardest things about being far from S. Carolina was being away from my Grandmother. When she looked at me I could tell she loved me and I always felt safe with her. St. John’s Island, Newfoundland was a long way from my nanny. I believe she would have seen something was going on that neither of my parents could see. My mother was pregnant with 3 children under the age of 6 years old. She didn’t have much time nor was she inclined to encourage her children to talk to her. My father was hungry for an older man to pay attention to him. The man who owned the house lived upstairs from our basement apartment and was more than willing to play the part of the older man in my father’s life. I sat on the ground playing so it must have been during the summer I turned five years old. The ground would have been too cold any other time of the year. Harold had been telling me how if I told anyone what he was doing to me, the police would do worse things to me. Even at five years old, I knew he was jerking me around, but I couldn’t hold on to it enough to figure out to get help. Harold was always thinking of ways to drive home I couldn’t tell anyone. He was afraid about my father and my sister who was a year and a half older. He knew I didn’t have a voice with my mother. He never worried about me telling her. He would threaten me with telling her I had done something wrong whenever he wanted to force me to do something. When the baby was born dead, he said more people would die if I told.